Former Egyptian leader Hosni Mubarak and his two sons have been sentenced to three years in jail by an Egyptian court on charges of corruption in a retrial from last May. 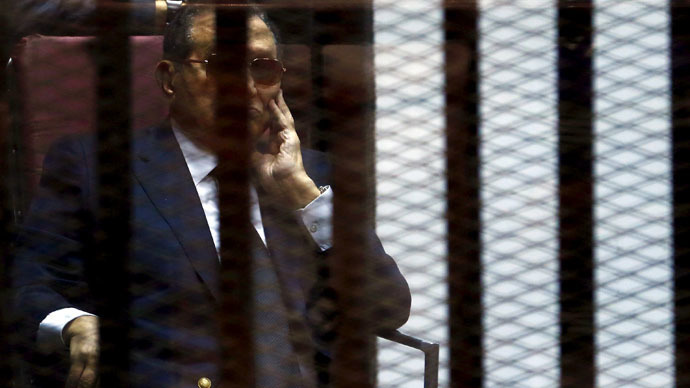 "The ruling of the court is three years in prison without parole for Mohamed Hosni Mubarak and Gamal Mohamed Hosni Mubarak and Alaa Mohamed Hosni Mubarak," the judge, Hassan Hassanein, announced Saturday. The sentence also included a fine of 125 million Egyptian pounds ($16 million), the sum that the court ruled was embezzled. The former leader was sentenced last year for appropriating funds to improve his own lifestyle, including for renovating presidential palaces. His sons were each given a four-year sentence at the time. In January, however, the convictions were overturned. But it appears now that the three might not even have to serve the latest sentence either, as they have already spent that amount of time in prison on other charges. Mubarak was toppled in 2011 in a popular uprising, which led to a tumultuous period for Egypt, with many hoping democracy had arrived at last, following three decades of strongman rule. The interim military government put Mubarak and members of his regime on trial, but later some of the charges, including inciting violence against civilians who protested on Tahrir Square, were dropped. The change people waited for did not come, however. President Mohamed Morsi and the Islamist Muslim Brotherhood were elected as the new government but failed to bring about lasting improvements in the economy or human rights. Morsi was then overthrown by the military in summer 2013 and later sentenced to 20 years in prison, following the deadly clashes that led to his toppling in July.